Overfishing is a major threat to the health of our oceans and the livelihoods of people who depend on them. However, thriving, resilient oceans that support more fish, feed more people and improve prosperity are within reach. Experiences from around the world show that sustainable management is possible when fishermen are given a secure share of the catch in exchange for strong accountability to science-based limits. What are secure fishing rights? A secure fishing rights program—also known as rights-based management or a "catch share"—allocates access to a fishing area or a share of a fishery's total allowable catch to a group or an individual. Programs establish appropriate controls on fishing mortality and hold participants accountable to their limits. Secure fishing rights can be administered as area-based or quota-based programs. Area-based programs, often called Territorial Use Rights for Fishing (TURFs) allocate secure and exclusive privileges to fish in a specified area. TURFs are assigned to groups or, in rare cases, to individuals. TURF participants, in turn, are required to comply with appropriate controls on fishing mortality and maintain a healthy ecosystem. Under quota-based programs, managers establish a fishery-wide catch limit and assign portions of the allowed catch, sometimes called catch shares, to participants. Many of the world's fisheries are overfished, threatening the food supply for a growing global population. Despite their importance, many fisheries are either poorly managed or have no rules at all, which allows fishing to exceed sustainable levels. Additionally, in many cases, fisheries lack scientific assessments to inform management decisions. Without a sense of the health of fished stocks, management will likely not achieve fishery goals. Most commercial fisheries start as open access—anyone who puts in the effort can fish. Fishermen often find themselves in a race for fish, with ever-increasing competition as more people participate in the fishery and fish become more scarce. As a first response, fishery managers often limit access by licensing participants. When this approach fails to control fishing effort and catches, managers put more and more restrictive regulations in place (i.e., trip limits, gear restrictions, etc.). In most cases, these regulations are unsuccessful in maintaining stable fish populations and creating safe and profitable fisheries. They also tend to frustrate fishermen, making it more difficult for them to run efficient fishing businesses. Over the past four decades, many fisheries worldwide have implemented secure fishing rights programs as an alternative to conventional management. Clearly defined fishing rights eliminate the pressure to race to catch as many fish as possible: fishermen have more flexibility to operate more efficient and profitable businesses, making fishing trips when the weather is fair and market conditions are opportune. They also have more time to fish selectively, dramatically reducing the amount of bycatch and discarded fish as well as the impacts on ocean ecosystems. The ability of fishing rights to align fishermen’s incentives and behaviors with the health of fish stocks distinguishes them from conventional management approaches. Fishing rights are helping ailing fisheries become productive and prosperous again. A variety of fisheries all around the world use this management approach, which can take various forms. Fishing right programs can be designed to meet the particular biological, economic and social needs of different fisheries. 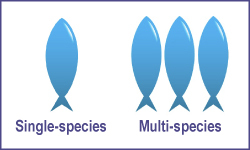 Programs can be single-species or multi-species fisheries. 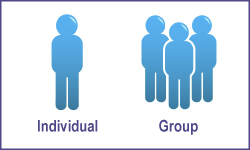 Allocations can be quota-based or area-based. The secure, exclusive privilege to fish can be for individuals or groups, such as communities or fishing organizations. 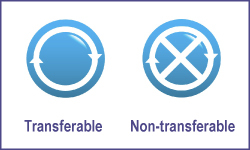 Quota can be permanently or temporarily transferable, or non-transferable. Our collection of step-by-step manuals provide guidance on the design of six commonly occurring types of secure fishing rights programs (See our Individually-Allocated, TURF and Cooperative pages for detailed definitions of the basic program types). 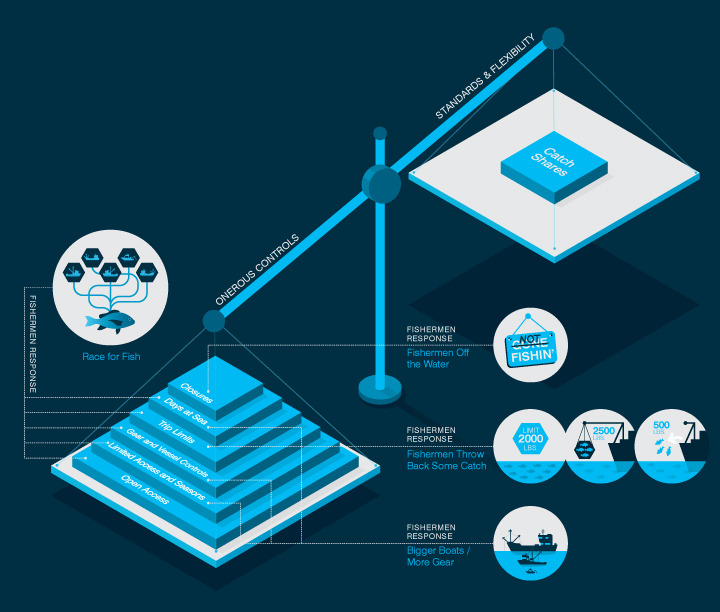 There are seven key attributes of secure fishing rights programs, described by the SEASALT mnemonic in our Design Manuals. 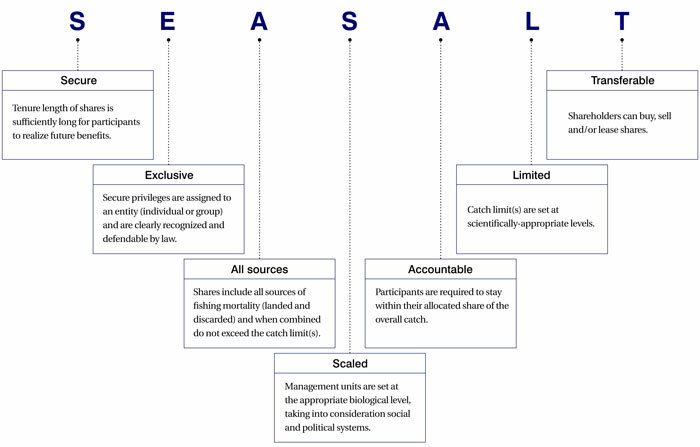 Although not all of these characteristics are required for a program to be successful, the more completely a program incorporates these traits, the more likely it will be to sustain a biologically healthy and economically profitable fishery. 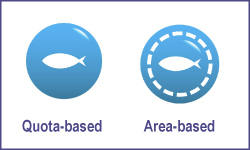 Our SEASALT Evaluation Tool can help you assess the presence or absence of these attributes in a fishery management system. Our Sustainable Fisheries Toolkit can help fishery managers, fishermen and other stakeholders design a secure fishing rights program tailored to your fishery's needs. Experience the joys and sorrows of commercial fishing by playing the game, What’s the Catch? A breadth of scientific research demonstrates the significant environmental and social, and economic improvements in fisheries that have transitioned to catch shares. Experiences, lessons and findings on the effectiveness of catch shares can be found in numerous academic studies, reports, videos and infographics.